Looking for a Dentist who services Sutherland Shire? Step into dental excellence with justSMILE, servicing Ramsgate Beach, Sutherland Shire and surrounding Sydney suburbs. Have you been looking for an experienced dentist who is skilled across the full spectrum of dentistry? 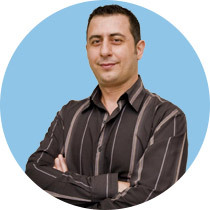 Look no further than Dr Rammo who welcomes his patients from the Sutherland Shire. Our highly skilled dental team is proud to be able to meet each and every one of your dental needs in our world-class dental practice. At justSMILE in Ramsgate our dental practice is equipped with state-of-the-art dental technology which enables us to provide the best dental care available. From the intraoral camera to laser dentistry we have the skills and technology to provide you with a treatment that can restore and enhance your smile. We take the time to explain your treatment thoroughly and help anxious patients from the Sutherland Shire, Ramsgate and the surrounding suburbs get the treatment they need and deserve. We begin encouraging children’s dental appointments early in their childhood to familiarise a child with the dental environment and to educate you about fluoride, diet, a child’s development and hygiene needs. The best time to bring your child to the dentist is around 6 months after their first tooth erupts, then continuing with six monthly check-up appointments. We provide informative tips for helping children develop a beautiful smile for our patients in the Sutherland Shire. We provide Laser Dentistry in order to effectively treat disease and contour the gums for an aesthetic appearance. Dental lasers can gently perform numerous soft tissue procedures with little or no bleeding and virtually no discomfort. They can also prepare your teeth in a way that maximises the bonding of tooth coloured fillings, allowing them to last longer. Laser Dentistry can treat dental concerns such as Root Canal Treatments, Periodontal Treatment, Fillings and Gum Contouring. Address tooth loss with Dental Implants and completely restore the appearance of your smile and the function of your teeth. Dr Rammo and the team at justSMILE are highly experienced in performing the Dental Implant process. We offer highly advanced Dental Implant technology in Singular Tooth Replacement and Multiple Tooth Replacement. We cater for emergencies by allotting time during practice hours. You can call us on 02 8417 2962 or if your accident happens after hours submit an enquiry and our team will call you back as soon as possible the next business day. If you are experiencing a dental emergency please visit our Emergency Appointments page for some helpful tips. justSMILE is a practice built on the foundations of excellence, innovation, honesty and care. We encourage our patients in the Sutherland Shire to visit justSMILE today to find out how our range of advanced dental techniques and technologies can help you improve your smile now and for the future. To experience dental excellence with justSMILE please book an appointment on 02 9529 7555 today. Dr Rammo and the team at justSMILE are happy to answer any questions you may have about your dental health and care.